Figure 8-9. - Buildings side by side. 2. Remove the windows, the door leaves, and the end wall. 3. Remove the diagonal brace angles and the sag rods. 4. Remove the braces, the girts, and the purlins. 5. Let down the frames. 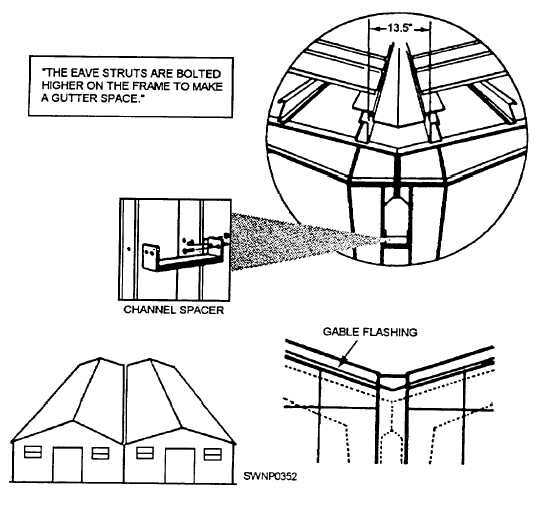 K-span buildings (fig. 8-10) are a new form of construction within the Seabee community. The intended uses of these buildings are as flexible as the pre-engineered buildings discussed earlier. The K-span building system consists of a self-contained, metal building manufacturing plant, known as the ABM 120 System/Automatic Building Machine 120. This machine is mounted on a trailer, forming a type of "mobile factory" (fig. 8-11) that is easily towed to even the remotest construction sites. An important aspect of this machine is that it can be transported by air anywhere in the world easily. In fact. the ABM System has been certified for air transport by the U.S. Air Force in C-130, C-141, and C-5 aircraft.